As fears build about a bubble in residential property, a growing number of property specialists are instead focusing on the medical real estate sector and dramatically transforming it in the process. BASE Architecture, says the medical industry is an important field for property service providers including architects, builders and designers because of its steady, demographically-driven growth. “A lot of developers are worried that residential is going crazy at the moment but we find that in any economic climate there is strong demand for medical facilities,” Mr Godwin said. To capitalise on the growing trend, BASE Architecture has formed a partnership with Craft Building Company, offering turnkey solutions ranging from modest consulting room fitouts in office buildings to multi-level purpose-built facilities costing $20 million. They estimate that between them they have built or fitted out almost 50 medical practices, including clinics for GPs, radiologists, plastic surgeons, dentists and gynaecologists. BASE Architecture founder Shawn Godwin[/caption]The medical market is huge and growing, with research firm IBISWorld estimating that health services revenue grew at a compound annual rate of 4.2% over the five years through 2015-16, almost twice the rate of GDP growth. In 2016, revenue for the sector was $123.1 billion, making it one of the biggest industries in Australia and a huge market for specialised premises. Hospitals account for approximately half of the revenue, while GPs, specialists and dentists contribute most of the remainder. Pathology and diagnostic imaging are also significant money-spinners. Mr Godwin says the growing demand for medical fitouts and purpose built facilities is also being driven by the increasing competition in the sector. “Gone are the days when one provider enjoyed a local monopoly on one kind of service like x-rays,” Mr Godwin said. “Doctors are now asking how they can set themselves apart not just in their field but also in terms of the experience when patients come to their practice. A clinic redesigned and refitted by BASE Architecture[/caption]Godwin says the impact of a well-considered practice design can be huge, with the potential to boost the client base by up to 40 per cent in a relatively short time. This also means a property developer who gets the facility design right can add substantial value to their asset. He cites the example of a tired old surgery he redesigned for a plastic surgeon two years ago with remarkable results. “As plastic surgeons they did a lot of elective surgery and people would come in to get their nose fixed or whatever and they’d look around and see a 20 year old fitout and think “this may not be the guy I want to operate on my face,”” Mr Godwin said. “Then we did the fit out - and it’s is quite a crafted piece of architecture - and people now think “wow they’ve put thought into every corner and detail. Not a great place to spend your final days[/caption] The same waiting room after redesign[/caption]Since redesigning the surgery, their clientele has grown 30-40 per cent. They attributed that to better client presentation and a more efficient design which had improved staff morale with a big increase in client satisfaction. “Like most traditional practices, their operating rooms were too big but their consult rooms were too small,” Mr Godwin said. “Through clever planning and really understanding what the nurses and administration staff want in a 160 sqm fitout we’ve changed the way they operate, the way they feel. While the economic arguments for good clinic design are compelling, Godwin said that most doctors also want a nicer environment because of their concern for their patients’ happiness. 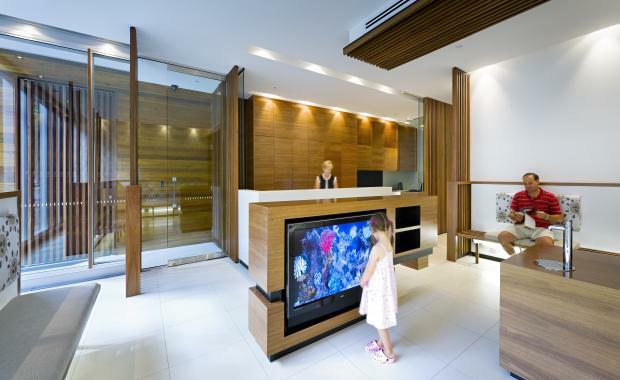 Godwin recently completed a small fitout for a neurologist who was mainly worried about her patients’ emotional state. “She said look, at the end of the day 75 per cent of people are terminal. This refit is all about how to make them feel, when they walk in that door, that - hey - if this is going to be my last day then it’s not a bad place to be. A depressing-looking medical clinic before redesign[/caption] The same clinic after redesign[/caption] The separated "Kid's Zone" waiting room at the clinic features a Lego Wall[/caption]Godwin uses a variety of methods to create a homely, relaxed atmosphere, including timberwork which is generally associated with residential buildings. Godwin says that there is nothing to stop developers applying the same principles to a multilevel facility. “Why can’t the lift lobby smell like your house instead of the cold, sterile, get-in get-out approach that most medical centres have,” he said. free seminar series, Can clinic design make or break your business? with the inaugural Brisbane event on the evening of 27 April.